If you are tired of dealing with picky kids who won’t eat their vegetables then this post is for you. 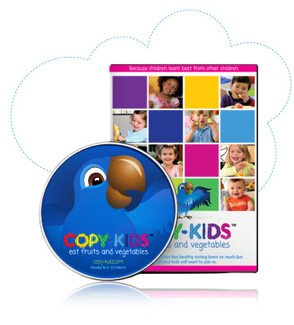 Today we are giving away a tool that will encourage your kids to gobble down their veggies and fruit…it’s a DVD called Copy-Kids (along with a $100 gift card to Whole Foods or your favorite grocery store!). Copy-Kids produces award-winning videos that encourage positive habits in young kids. The video is somewhat similar to Baby Einstein in nature, but instead features kids eating twelve different fruits and vegetables. The DVD says it’s for babies/kids ages 6 months – 5 years, but my 7-year-old (and Kiran’s 8-year-old) both found it hard not to watch! You get to pick which fruit or vegetables the kids on the DVD will eat next…and for my children that was the fun part. My 7-year-old even wanted to watch the interview with pediatrician Dr. Jay Gordon at the end (which is meant for the parents)! A DVD featuring children eating 12 different fruits and vegetables. The winner of two children’s excellence awards. Approved by the USDA and added to their Education and Training Materials Database for pre-school nutrition. 1st entry: Please leave a comment below sharing which vegetable you’d be most excited to see your child try. See the Copy-Kids website for a full listing of vegetables featured. 2nd entry: If you like Copy-Kids on Facebook you can leave another comment below. Just say “like Copy-Kids” on your second entry/comment. The contest will end at midnight EST on Monday, October 15th. The winners will be selected at random and announced on the “100 Days of Real Food” Facebook page as well as emailed directly (so make sure your address is entered correctly in your comments below!). The winner will have 3 days to respond before they are disqualified, and a new winner is chosen. Giveaway: Duralex Glass Cups for Kids! I’d love my girl to eat bell peppers! I often sautee chicken with bell peppers and onion and she literally will pick every single piece out! Crazy kid! I’d love for them to try acorn squash! Either avocado or tomato. They already eat the other foods listed. I would love for my youngest to eat tomatoes and peppers. He picks them out of everything!! Though my boys eat a lot of veggies and fruit, I would love to see them eat avocados, and bell peppers. I can’t cook with them because they simply won’t eat anything that they touch. My gardening would be such a better experience if my kids would join me in eating the vegetables. I would love for them to eat cucumbers without them being pickled first. squash! something besides corn, carrots, or beans. and those, I have to beg her to eat. I would love to see my kids eat bell peppers or tomatoes.